Our deluxe end-unit 3 BR + Loft, 3 Bath townhome home lies just at the base of Alpine Meadows Ski Resort and is the perfect location for winter, summer, or any time of the year when you just want to get away from it all. This convenient location, immediately off Rt. 89, provides easy access to all the nearby ski- areas. Only 5 minutes driving will get you to either Alpine Meadows or world-renowned Squaw Valley ski resorts, and it’s an easy and direct drive to either Tahoe City or Truckee for shopping and dining. This beautiful 3–story end-unit townhome, located in the River Run complex, is spacious, clean, comfortable, well appointed, and will easily satisfy all your vacation needs. The townhome comfortably sleeps up to 10 as follows: (2 bedrooms with King beds, 1 bedroom with Queen bed, and Loft area with 2 twin beds and 2 trundle beds (a perfect location for either 2 adults or 4 kids) This home also has 3 full baths, a fully appointed kitchen, with microwave and all appliances, washer/dryer, extra large dining table with seating for 8 - 10, gas barbeque grill, wireless internet service, and gas burning fireplace with firewood included. The beautifully decorated living room has a gorgeous stone front wood burning fireplace (gas-fired). You can just relax in the living room after skiing and enjoy the crackling fire, or watch a movie on the large flat screen TV or on the Blue-ray DVD player included. The large oak dining table is expandable and can easily seat 10 for meals. The warm and comfortable atmosphere in our townhome will immediately make you feel welcome and “right-at-home”. The ground floor level has 2 large bedrooms each with its own separate full bath. The washer/dryer area is also located on this level. The main floor includes the kitchen, dining and living rooms, the 3rd large BR, and full bath. The loft, with single bed sleeping for up to 4, is on the 3rd level. Additionally, the River Run complex has a large hot-tub facility, sauna and bathhouses for guests to enjoy all year-round, plus a pool and tennis courts for summer. For everyone’s good health and protection of all our guests, our home is a NON-SMOKING property. And although we just love dogs, we regret that the homeowners association has a strict NO PETS POLICY!!! We had a great stay at Alpine Meadows! The house was large, extremely clean, with great amenities. Using the community hot tub at the end of a long day skiing was perfect. Comfortably fit 8 adults with plenty of room around the table for dinner and games. Overall a fantastic trip with a great host. Great Location to both Alpine and Squaw Valley and to Tahoe City. 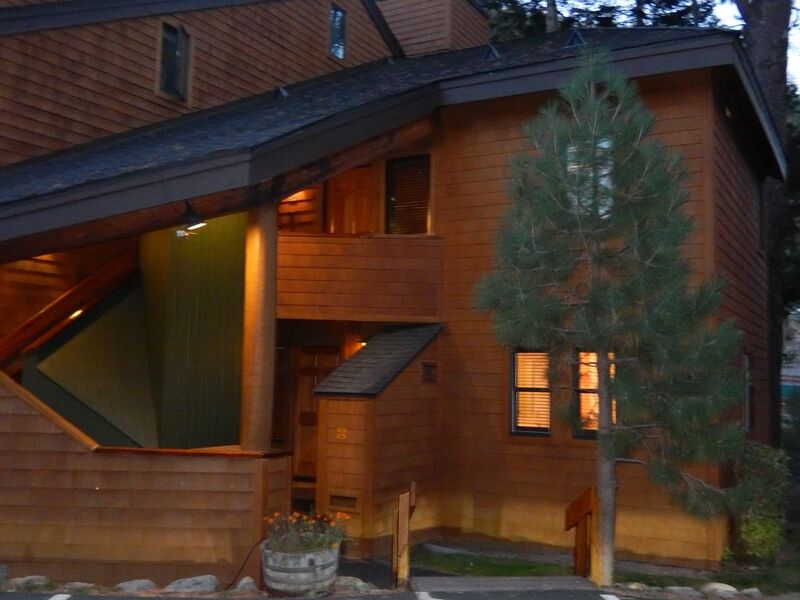 Very clean and comfortable accommodations located right by Truckee River. We will definitely stay here again. Phyllis was great to deal with! Perfect condo for my recent ski trip to Squaw/Alpine Meadows. Clean confortable place with plenty of bathrooms. Very cozy feeling that gives a home away from home feeling. Views of the Truckee River outside the windows is amazing. We only had four in our group but place can easily sleep 10 if you double up in the Queen and king beds. Owner very organized and responsive. Already planning to come back with a bigger group next year. Great experience this time around with VRBO. Thank you for your positive review. I am so happy that you had a wonderful stay and enjoyed our home and the North Lake Tahoe area. I hope you will come back again. Overall a great place to stay!! We stayed here for a few nights on a ski trip in February. The house was clean and ready for our stay. We skied at Squaw Valley, which was only about a five minute drive. Lake Tahoe was less than ten minutes away too. We really enjoyed the hot tub and sauna as well! The owner also left really helpful notes around to make our stay easier, like information about using the fireplace and the tv. Great place, beautiful location! I would highly recommend this place to anyone!! We rented this beautiful condo for a week in May 2015. We had nine adults in our party and the condo accommodated us wonderfully. The weather was not on our side and we spent four days inside because of rain. the nice open floor plan allowed us to cook and visit comfortable. The kitchen was nicely stocked and with the added leaf in the table it was big enough for meals and games. The bathrooms spacious and clean. Had wonderful reviews from family members on the comfort of the beds. We used the grill with no problems but wished we had some grilling tools. We were able to contact the owner with easy and received a speedy response. We loved the central location, easy access to bike path and attractions. Overall this is a great place and we enjoyed our visit. We rented this unit for 3 nights in April 2011 for a few days of spring skiing at Alpine Meadows. The condo is very well situated and had beautiful river views. The owners were extremely professional and emails and other communications were very prompt. This condo was all it was advertised to be. We had a total of 4 adults and 2 kids and had plenty of extra room. The bedrooms are very spacious and the living room is inviting. Best of all, the kitchen is well appointed (save for the older appliances which all still work very well). We were happy to find lots of dishes and any kitchen gadget we could imagine. We would definitely rent this unit again. A refundable security deposit of $300 is required with every reservation. This should be paid by separate check. The deposit is not cashed, and the original check is returned promptly after departure, pending the inspection report from the cleaning agent.